Rest assured that you won’t be penalized for mistaking Infiniti’s 2015 QX50 for it’s now-defunct EX progenitor. Rebadged in 2014, this 5-seat compact luxury crossover gets few significant changes for the 2015 model year. Although Infiniti may be tossing a few new colors and some interior tweaks into the mix, the only confirmed change is that the once-optional Bluetooth hands-free technology is slated to become standard throughout the lineup. Of course, said lineup is again expected to include only the QX50 Base and Journey iterations, with both delivered in standard rear-wheel-drive configuration (RWD). Each trim does, once again, remain eligible for available intelligent all-wheel drive (AWD). With its chic, almost fastback profile, the QX50 doesn’t look like your typical crossover. Alas, said spiffy looks allow only 47.4 cubic feet of cargo area and a somewhat cramped rear seat, thereby conceding utility and roominess to rivals like the Acura RDX, Audi’s heady Q5 and Beemer’s X3. But hey, according to virtually all reviewers, this pint-size crossover ute drives circles around pretty near everything else out there. Based on the performance-oriented G37 suspension and toting the ubiquitous 3.7-liter V6 powerplant of yore, this handsome head-turner uses a capable 7-speed shiftable automatic transmission to put out 325 hp and 267 lb-ft of torque. An Achilles heel, however, is the QX50’s unimpressive mileage numbers. With standard RWD, fuel efficiency estimates run 17 mpg city/25 highway, while AWD versions are pegged at 17/24. Meanwhile, the QX50’s AWD system allows RWD cruising in normal conditions while standing ready to divert up to 50% of available torque to the front wheels when things get sloppy out there. As for the luxurious part of the 2015 QX50’s equation, look for the Base trim to tote 18-inch alloy wheels, a rear spoiler, leather upholstery, power-adjustable front seats and full power accessories. Cruise control and telescoping tilt-wheel steering also come standard in the entry-level Base trim, as do a rear-view camera and dual-zone climate control. Simulated alloy cabin accents and a leather-wrapped steering wheel again contribute to the high-end look and feel of this classy crossover, while the new-for-2015 standard Bluetooth hands-free technology keeps everyone in touch. Want heated front seats and heated outside mirrors? 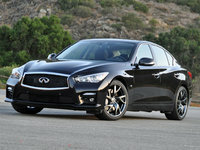 Then you’ll have to drive away in the Base AWD sub-trim. Anyhow, entertainment-wise, prospective owners can expect both trims to sport an AM/FM stereo system that will be complemented by a 7-inch dashboard-mounted video screen, 6 speakers, satellite radio and auxiliary iPod integration via a USB port. Moving up to the flagship Journey, look for a return of such standard extra posh as a power sunroof, a power telescoping and tilting steering wheel, a remote garage door opener and an auto-dimming rear-view mirror. Additionally, genuine wood inserts further boost the already plush cabin ambiance. Also for 2015, expect the QX50 Journey to again remain eligible for such available add-ons as the Premium Package, with navigation, a 360-degree camera, front and rear parking sensors, Bluetooth streaming audio and 11 Bose premium speakers all in a neat, if expensive, parcel. The Deluxe Touring Package, meanwhile, adds 19-inch aluminum wheels, memory for driver's and front-passenger's settings, power-folding second-row seats and high-intensity-discharge (HID) headlights. Finally, the usual standard safety features like 4-wheel antilock brakes (ABS), traction and stability control, front and rear head airbags, front side-mounted airbags and front head restraint whiplash protection are all scheduled to return in 2015 QX50 editions. Additionally, look for standard front fog/driving lights and a remote antitheft alarm to remain in both trims, along with the Journey’s optional Technology Package with its adaptive cruise control, blind-spot warning, lane-departure alert, forward-collision warning and emergency braking preparation. 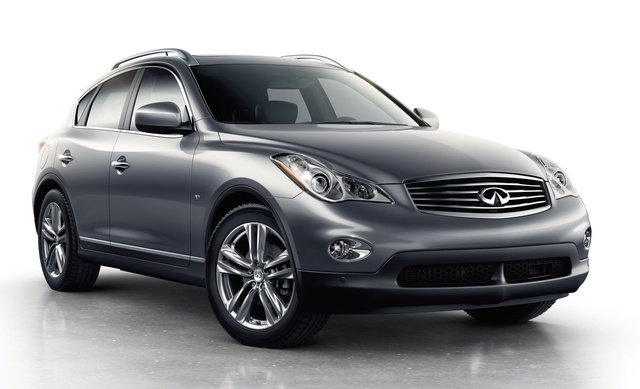 What's your take on the 2015 INFINITI QX50? 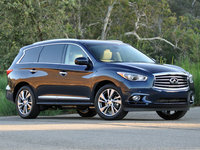 Users ranked 2015 INFINITI QX50 against other cars which they drove/owned. Each ranking was based on 9 categories. Here is the summary of top rankings. 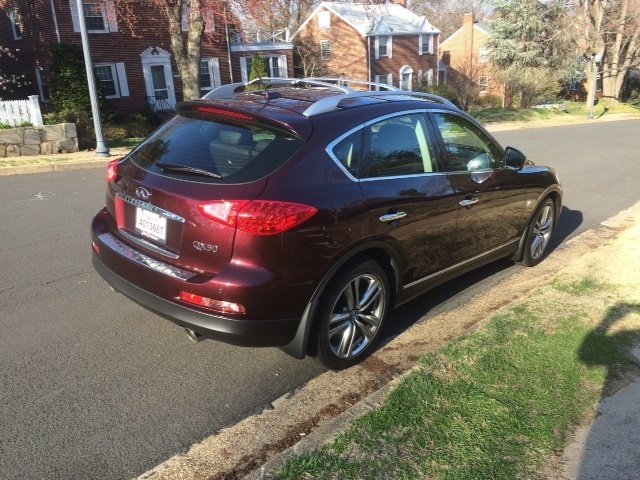 Have you driven a 2015 INFINITI QX50?